Oliver’s background in construction, particularly in the realms of residential development projects, was the catalyst for the launch of Foxstow Joinery. The company started life as a general joinery workshop, manufacturing a broad range of joinery products for domestic construction projects, but now specialises in the manufacture of high-quality solid timber doors, under the Foxstow ‘Shaker Doors’ banner. The decision to specialise in door making was in part due to the expertise and reputation already gained in this area, but also to cater for a growth in demand for high-quality competitively-priced timber doors. “We design and build almost every possible type of external, internal and cabinet door, along with associated cabinetry,” says Oliver Bryan, “and, with our team of skilled craftsmen and the company’s wider expertise in bespoke joinery manufacture, we are able to offer our clients extended support on new-build or renovation projects. “ The company currently employs around 15 people and is undergoing a period of rapid growth – especially in the fitted kitchens and bedrooms market, where Fox-stow Shaker Doors are manufacturing bespoke doors and drawer fronts to fit standard cabinets supplied by the likes of Howdens and IKEA, as well as designing and manufacturing additional pieces of matching, custom-built cabinetry when required. Production space at Foxstow Joinery is very much at a premium, so providing a machine with a footprint to fit the restricted floor space was the first challenge SCM needed to overcome. 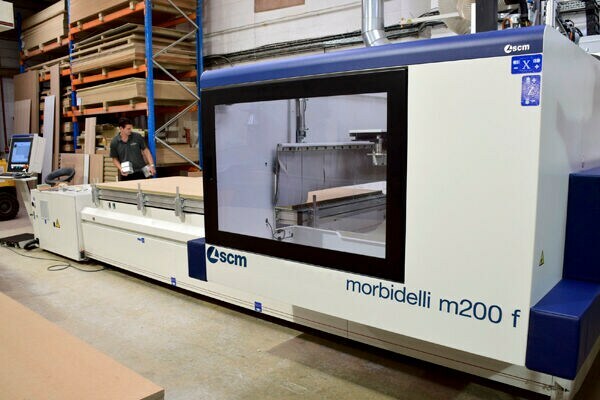 Taking all of Foxstow’s requirements into account, Jamie’s proposal was for the installation of a morbidelli m200 f; one of SCM’s new “All-in-one technology” range of CNC machining centres. 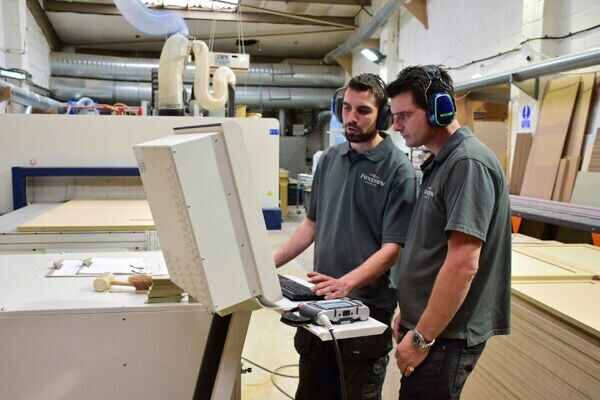 The morbidelli m200 f was in fact so new that there were no other installations in the UK to demonstrate the machine’s capabilities, and Oliver was invited to see a similar machine put through its paces at the workshop of an SCM customer in Essex. “The machine we demonstrated for Foxstow was a m400,” says Jamie Walters. “The m400 has a larger capacity than Foxstow required, and was too big for the space available, but the demonstration proved to Oliver that this was the right technology to satisfy Foxstow’s production requirements.” In common with many growing manufacturing businesses, Foxstow didn’t have an open-ended budget and, although SCM had been his first port of call, Oliver also evaluated similar machines on offer from competing manufacturers. However, with the SCM machine ticking all the technical boxes, Oliver committed to an order just a few weeks later. 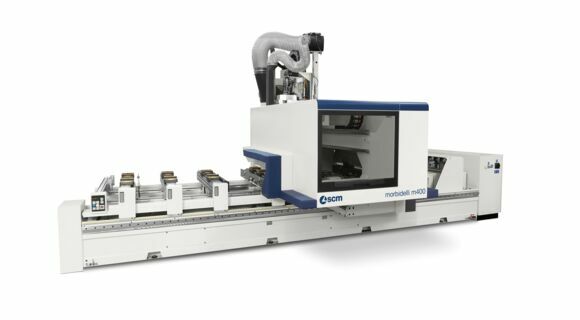 The compact footprint of the m200 f, coupled with SCM's "Pro-Space" solution, facilitates installation in the tightest of spaces and is able to process a sheet width up to 1900mm, with a maximum working width of 1620mm, 3110mm lengthways, and vertical clearance height of 250mm. Operator safety is assured by sensors, incorporated into the soft-cushioned bumpers on each side of the moving gantry, which react instantly on contact with any obstacle; immediately stopping all machining operations. The complete absence of restrictive fences around the machine, together with the fully integrated electrical cabinet and vacuum pump, allows operators total freedom and access to all sides of the work table during machining operations, and the large viewing window, which opens for cleaning and maintenance, provides an unrestricted view of machining operations. The morbidelli m200 f is loaded with a range of unique technologies: SCM's Rotoaxial "RO.AX" spindle technology, for example, with unrivalled maintenance intervals of 1,000 operating hours and drilling speeds up to 8,000rpm, guarantees stability and accuracy during fast drilling operations; the "JQX" 5-axis unit allows tools to be oriented in virtually any direction, and allows machining up to 10° below the horizontal plane; and the continuous aluminium alloy table provides uniform distribution of vacuum to the workpiece, with vacuum outlets spaced 12cm apart in both directions, positioning and unloading operations efficiently and safely. Before the introduction of the morbidelli CNC machine, Foxstow were making all their shaker design doors with traditional joints, using the classical machinery. 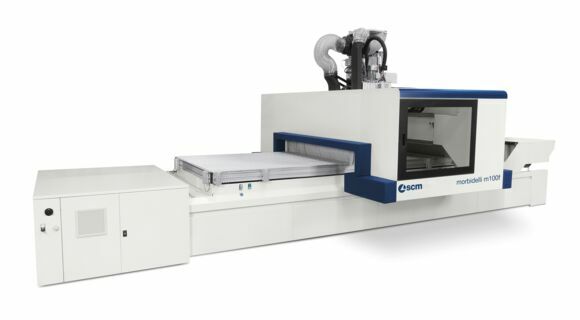 Introducing the CNC machining centre has revolutionised sheet production and improved efficiency, quality and safety. And, as well as the significant benefits of machining sheet materials, the POD element of the morbidelli m200 f now allows Foxstow to machine other bespoke pieces such as pelmets, cornices, and curved-head doors and frames. The 130mm x 130mm square vacuum pods are easily and quickly positioned and fixed in any position across the entire worktable surface; allowing fast positioning and set-up of workpieces ready for machining. Foxstow have got off to a flying start with a comparatively minimal range of Vivaldi tooling, supplied by Viscount Tooling, but the objective is to build on this range over time, as and when new product designs demand a more complex collection of tools. As with all SCM CNC machines, the morbidelli m200 f utilises SCM's proven Xilog Maestro 3D CAD/CAM software suite. The software is highly intuitive with simple 'drag-and-drop' functionality to many regular operations, in addition to all the standard in-built functions such as;- importing of IGES files, editing contours and curves, etc. Preconfigured geometries and drilling/routing patterns available from the Maestro APPS library, it enables the operator to create bespoke macros and sub-programs. Machine operations are programmed and managed from the mobile control console, which incorporates a Windows-based PC and 19" colour monitor and, with the console connected to an internal network, design data can be transferred from networked PCs; optional internet connection provides access to SCM's service and diagnostics network. In addition, the specification for Foxstow included a "TECPAD" remote control, with 7" touch-screen colour display, allowing control over a multitude of program and machining operations, including manual speed override, error management and graphic positioning of rails and pods.